Norway is boosting the flood defences of its Global Seed Vault on the Arctic archipelago of Svalbard after water entered the entrance tunnel last year. The storage facility, deep inside a mountain, is designed to preserve the world's crops from future disasters. Unseasonably high temperatures last year caused the permafrost to melt, sending water into the access tunnel. No seeds were damaged but the facility is to have new waterproof walls in the tunnel and drainage ditches outside. The vault stores seeds from 5,000 crop species from around the world. Dried and frozen, it is believed they can be preserved for hundreds of years. Although most countries keep their own supplies of key varieties, the Global Seed Vault acts as a back-up. If a nation's seeds are lost as a result of a natural disaster or a man-made catastrophe, the specimens stored in the Arctic could be used to regenerate them. Scientists at the facility describe the vault as the most important room in the world. 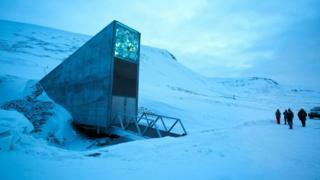 Government spokeswoman Hege Njaa Aschim told the BBC that the reason the vault was built on Svalbard was because the permafrost was thought to be permanent. She said the problems emerged last October when the temperatures, instead of being -10C or colder, were hovering around 0C. "It was like a wet summer in Norway," she told the BBC. "Inside the mountain it's safe but the problems we have experienced are just outside and in the front of the tunnel, which is the entrance. So Yes, maybe something has changed in the permafrost, but we don't know, and that is what the climate researchers are looking into. We have to follow them carefully." The new measures announced include drainage ditches on the mountainside to stop water from accumulating around the access tunnel. Waterproof walls inside the tunnel itself will provide extra protection for the vaults. In addition, Statsbygg, the agency that administers the vault, is to carry out a research and development project to monitor the permafrost on Svalbard.